See the bigger picture Mr. Darwin. The science behind prenatal genetic selection fails to recognize that cutting off a portion of our human species that we consider ‘less worthy’ will alter the humanity of the species that live on. A woman drags her son, who has a range of health and mental issues, to a doctor. ‘Doctor Freud’, she starts, my son abuses drugs, is kicked out of school, cannot do anything for himself and hurts himself’. ‘Poor upbringing’, is the doctors’ verdict. Insulted the women walks into the office next door for a second opinion. ‘Doctor Darwin, my son abuses drugs, is kicked out of school, cannot do anything for himself and hurts himself’, the woman says. ‘Bad genes’, concludes Darwin, ‘nothing can be done’. At her wit’s end with the hopelessness of the situation she decides to give it one more try and walks in the door of a third doctor. The pernicious assumption that a poor development, health and well-being is set in stone, in our genes, has been the driving force behind the development of prenatal screening programs in the United States and abroad for the past few decades. In 2011, the latest triumph in prenatal testing was introduced: the NIPT (Non Invasive Prenatal Test). This DNA test can, with reasonable accuracy, detect Down syndrome in early pregnancy from a single drop of blood taken from the mother. Hailed by medical professionals as the Holy Grail in prenatal testing, the NIPT has quickly spread across the globe. But, while genetic fetal testing is technologically very advanced, the ideology upon which it is based, is outdated, discriminatory and dangerous to the human species. Genetic testing claims to predict the future and quality of life based on genetic knowledge alone. In doing so it underestimates factors like lifestyle, education, inclusion, and love, in achieving a healthy, rewarding life. Angela Bachiller is a counselor in a Spanish town. Tim Harris is a restaurant owner. Garrett Holeve is an MMA fighter. Pablo Pineda is an Actor, who also holds a degree in Teaching and a BA in Educational psychology. Angela, Tim, Garrett and Pablo also have Down syndrome. They were able to become the persons they are today, because they were given a chance, included, educated, and their lives celebrated. In the sixties many children with Down syndrome and other disabilities were housed in institutions. It was assumed that all their problems were caused by their DNA. Many grew up to become dependent adults with poor health and a short life-expectancy. Today we know the truth that these children were limited by low expectations of others, a serious lack of medical care, education and cruel segregation from their families and society. “the United Kingdom National Down Syndrome Cytogenetic Register (NDSCR) reports that in 2012 92% of women with a positive prenatal diagnosis terminated the pregnancy. Similar numbers prevail in the US. This is not healthcare. This is not progress. This is an outright denial of the advances made by people with Down syndrome. This is discrimination in its most extreme form. The debate about whether ‘nurture’ or ‘nature’ is more important has not, even after a century of inquiry, lead to a definitive answer. Now, Epigenetics, the new kid on the science-block is dissolving the imaginary line between the two. Epigenetics is scientifically proving neither is more important: human development and our physical, mental and spiritual well-being is largely the result of a complex interaction between our genes and our environment, the biosphere. Our development, health and spiritual well-being is largely affected by the choices we make. Humans change the expression of most of their genes by diet, exercise, and their social and spiritual life. Science is asserting what Angela, Tim, Garrett and Pablo and billions of other people are doing daily: changing the course of their lives for the better by making better choices. So if making better choices affects our live for the better, poor choices do the opposite. Geneticists, to their surprise, are finding epigenetic change can be passed down from parent to child, one generation after the next. Poor choices such as dumping large quantities of toxins in our environment will, therefore, cause adverse epigenetic change. Research and surveillance agencies worldwide are reporting an “increasing occurrence of congenital disorders that lead to mental retardation or dysfunctioning body organs”. Hawaiians spike in birth defects are linked to the intensified use of pesticides in genetically modified crops. The choice is stark. Are we simply going to let industry and governments unjustifiably screen out all babies with identifiable differences from our communities? Or are we going to advocate for a sustainable future which is clean, tolerant and inclusive? A future that respects the individual but sees and prepares for the big picture in the biosphere we all live in, and are treating as expendable. I have two daughters with Down syndrome. 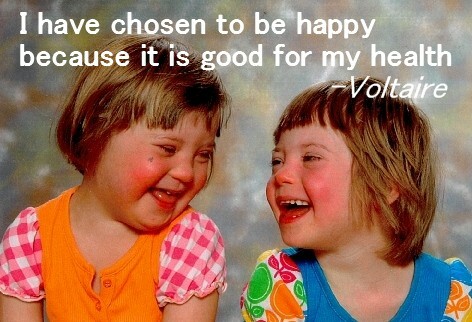 Their lives are not defined by the presence of an extra chromosome. Sure the road to fluent speech, flawless writing, and coordinated bicycling is often filled with obstacles, but they don’t let it ruin their day, much less their lives. They are consumed with more important stuff like Saturdays’ dance recital or Sundays’ soccer game. Of course, like any kid, mine can drive a mother insane. Hazel can be stubborn as a mule and April can take an hour to get dressed. My daughters have an uncanny ability to accept their flaws and those of others without judgment and still fully enjoy life. By doing so they spread love, simplicity and joy to the people around them. That makes my daughters perfect human beings and wonderful company. People with Down syndrome, as a group, were nominated for the 2014 Public Peace Prize for their ‘real ability to diffuse peace around them’. These human traits are needed more than ever in today’s fast paced, money and self-centered society. With the imminent onset of tests that efficiently and affordably analyzes the whole genome of an unborn baby, fetal genetic testing should concern us all. It is the beginning of something we don’t know the ending of. If this technique, leads to acceptance of genetic screening and selection for Down syndrome, you don’t have to read sci-fi books to know more human species will be singled out for selection in the future. Who will be next? People with lower IQ’s, a different sexual preference or psychological predisposition, your off-spring? Oh and by the way that woman and her son came out of the third doctors’ office an hour later with a new lease on life. The son gave up drugs, went back to school and is now the chef and owner of a restaurant serving the finest, organic foods. His mother manages the waiting staff.